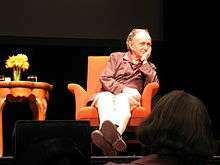 Frederick Wiseman (born January 1, 1930) is an American filmmaker, documentarian, and theatrical director. In 2003, Wiseman was awarded the Dan David Prize for his outstanding films, which make us reckon with our emotions and the cost to society of marginalizing those who cannot speak for themselves. In 2006, Wiseman received the George Polk Career Award, given annually by Long Island University to honor contributions to journalistic integrity and investigative reporting. The first feature-length film that Wiseman produced was The Cool World in 1963. He next produced and directed Titicut Follies (1967). He has both produced and directed all of his films since. They chiefly are studies of social institutions: for example, hospital, high school, police department. All have been aired on PBS, one of his primary funders. What I try to do is edit the films so that they will have a dramatic structure, that is why I object to some extent to the term observational cinema or cinéma vérité, because observational cinema to me at least connotes just hanging around with one thing being as valuable as another and that is not true. At least that is not true for me and cinema verité is just a pompous French term that has absolutely no meaning as far as I'm concerned. In spring 2012 Wiseman took actively part in the three month exposition of Whitney Biennial. In 2014 he was awarded the Golden Lion for Lifetime Achievement at the 71st Venice International Film Festival. In 2016, he was a recipient of an Academy Honorary Award from the Academy of Motion Picture Arts and Sciences. Wiseman's films are, in his view, an elaboration of a personal experience and not an ideologically objective portrait of his subjects. [My films are] based on un-staged, un-manipulated actions... The editing is highly manipulative and the shooting is highly manipulative... What you choose to shoot, the way you shoot it, the way you edit it and the way you structure it... all of those things... represent subjective choices that you have to make... In [Belfast, Maine] I had 110 hours of material ... I only used 4 hours – near nothing. The compression within a sequence represents choice and then the way the sequences are arranged in relationship to the other represents choice. I think I have an obligation, to the people who have consented to be in the film, ... to cut it so that it fairly represents what I felt was going on at the time in the original event. Present in every Wiseman film is a dramatic structure. Not necessarily a narrative arc per se – his films rarely have what could be considered a distinct climax and conclusion; any suspense there may be is at a per-scene, human experience level and not constructed from carefully placed plot points; there are no consistent human characters with whom the viewer is expected to identify. Nevertheless, Wiseman feels that drama is a crucial element for his films to "work as movies" (Poppy). The "rhythm and structure" (Wiseman) of Wiseman's films pull the viewer into the position and perspective of the subject (human or otherwise). The viewer feels the dramatic tension of the situations portrayed in the films, as various environmental forces create complicated situations and conflicting values for the subject. I'm trying to make a movie. A movie has to have dramatic sequence and structure. I don't have a very precise definition about what constitutes drama but I'm gambling that I'm going to get dramatic episodes. Otherwise, it becomes Empire. ... I am looking for drama, though I'm not necessarily looking for people beating each other up, shooting each other. There's a lot of drama in ordinary experiences. In Public Housing, there was drama in that old man being evicted from his apartment by the police. There was a lot of drama in that old woman at her kitchen table peeling a cabbage. A very distinctive aspect of Wiseman's style is the complete lack of expository (narration), interactive (interviews), or reflexive (revealing to the viewer some part of the filmmaking process) elements. Regarding the lack of reflexive elements, Wiseman has stated that he does not "feel any need to document [his] experience" and feels that such elements in films are vain. In the process of producing a film, Wiseman will often acquire more than 100 hours of raw footage. His ability to create a feature-length film that is engaging and interesting, without the use of any voiceover, title cards, or motion graphics, while still being "fair", is the reason why Wiseman is seen as a true master of documentary film. ↑ Philippe Pilard (August 26, 2012). "Frederick Wiseman, Chronicler of the Western World". La Sept/Arte. ↑ Frederick Wiseman Biography (1930-). Filmreference.com. Retrieved on 2014-05-22. ↑ "Laureates 2003". Tel Aviv University. Retrieved 4 November 2015. ↑ Roberta Smith (March 1, 2012). "A Survey of a Different Color 2012 Whitney Biennial". NY Times. Retrieved March 5, 2012. ↑ "Thelma Schoonmaker and Frederick Wiseman Golden Lions for Lifetime Achievement". labiennale. Retrieved 7 September 2014. ↑ Spotnitz, Frank (May 1991). "Dialogue on film". American Film. 16 (5): 16–21. ↑ Poppy, Nick (2002-01-30). "Frederick Wiseman". Salon.com. Retrieved 2007-11-12. ↑ Peary, Gerald (March 1998). "Frederick Wiseman". Retrieved 2007-11-12. ↑ Lucia, Cynthia (October 1994). "Revisiting High School – An interview with Frederick Wiseman". Cinéaste. 20 (4): 5–11. ↑ "News & Events". champselysees-paris.com. Retrieved August 26, 2012. ↑ Philippe Pilard. "Frederick Wiseman, Chronicler of the Western World". La Sept/Arte. Retrieved August 26, 2012.